I made a beautiful meal! 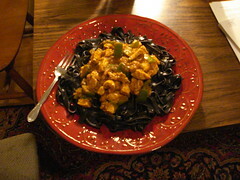 It's Chicken Vindaloo with coconut and squid ink pasta. I threw in some green peppers for color and spice! It was fun. The sauce was from Maya Kaimal. I added a lot of olive oil to the sauce and some extra chile pepper. I finished it off in about 10 seconds. By myself. And...look at that awesome plate.